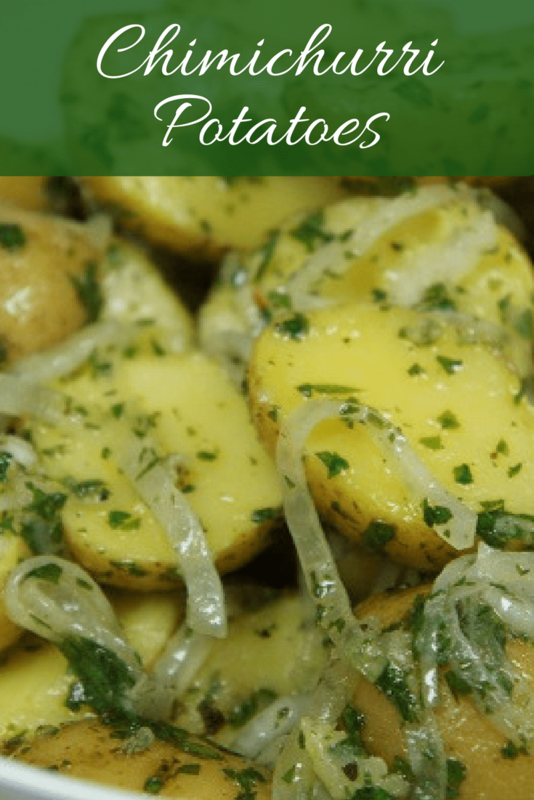 These chimichurri potatoes make an easy and delicious side dish. Chimichurri is a condiment of Argentinian origin that is typically served with meat. It’s a simple combination of parsley, olive oil, vinegar and spices. 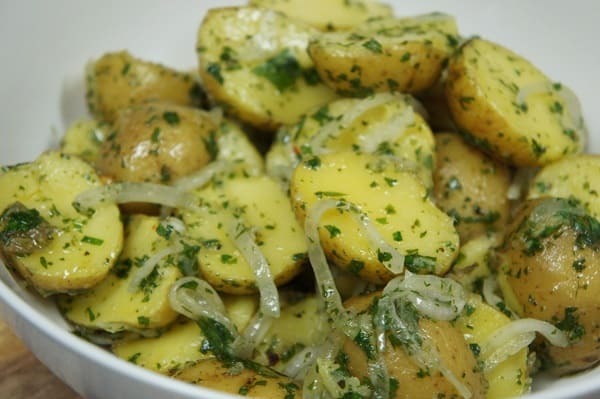 In this recipe we re-purpose chimichurri and serve it with potatoes, making a scrumptious potato salad that is worthy of your finest barbeque. I like making Chimichurri with flat leaf parsley but when it is not available at the market, curly parsley works well too. There’s no point to making just a little bit of chimichurri. 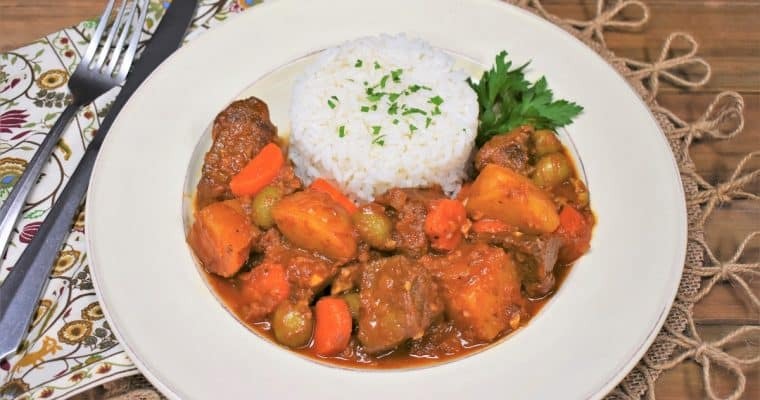 This recipe makes about a cup and you only need about ¼ cup for the potatoes. Save the remaining chimichurri in an airtight container and store in the refrigerator for a few days. Use the chimichurri on chicken, pork, steak or even rice. Wash the parsley thoroughly and pat dry. Chop the parsley as fine as possible. Add the parsley to a medium bowl. Add the oregano, garlic, 1 tsp. salt, black pepper, red pepper flakes, olive oil and vinegar. Stir the Chimichurri well until all of the ingredients are combined. Refrigerate the Chimichurri for at least one hour to allow the flavors to meld together. Remove from the refrigerator and allow the Chimichurri to come to room temperature before serving. Wash the potatoes and place them in a pot. Cover the potatoes with water by a couple of inches, add about 1 tsp. of salt to the water and bring to a boil. 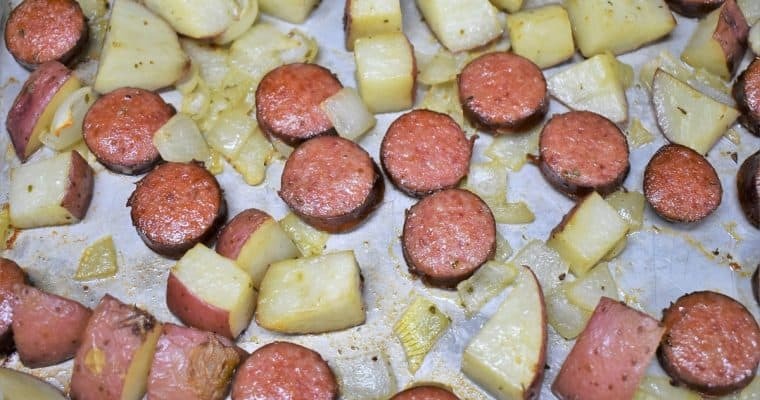 Cook the potatoes for about 25-30 minutes, or until they are fork tender. You should be able to easily insert a fork into the largest potato without any resistance. When the potatoes are done, drain all of the water and set aside to cool. When the potatoes are cool enough to handle, slice each in half (or if using larger potatoes, cut into quarters) and place them in a large bowl. Stir in about ¼ cup of the prepared chimichurri, the onions and a sprinkle or two of salt, if desired. Toss the potatoes gently so they do not break apart. Serve the chimichurri potatoes at room temperature or cold, refrigerate until ready to serve.